Magento is undoubtedly the most popular eCommerce platform, with a market share of 29.1%. The giant eCommerce platform has come a long way in helping more than 240,000 eCommerce stores thrive successfully in such a competitive industry. Its unique, rich and powerful features have managed to attractmany major eCommerce big shots like Huawei, Mara Hoffman, Paul Smith and so much more. In November 2015, the much awaited release of Magento 2.0 was announced. With Magento 2.0, eCommerce stores have witnessed a much more convenient and efficient platform that helps them focus on increasing sales. So, what’s the big deal about Magento 2.0? What makes it a great pick for business owners and developers? Although Magento 2.0 was scheduled to be released in 2011, the brand new version has plenty of exciting features that makes it worth the wait. 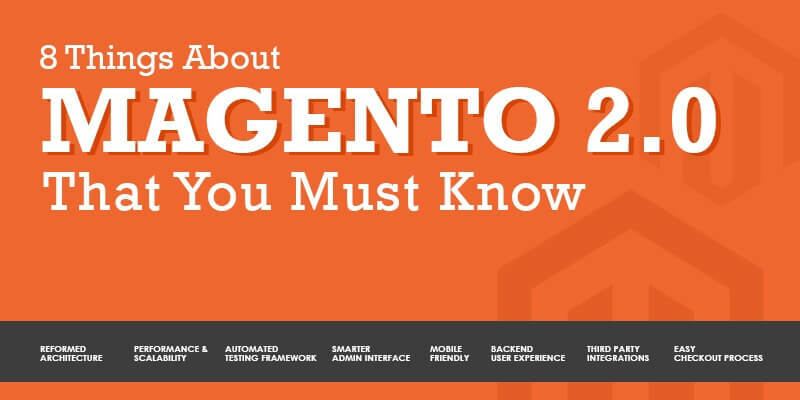 Here’s all that you need to know to know about Magento 2.0. Magento 2.0 is built on Zend framework and has a modular codebase. This makes the program code highly robust, easy to customize and deploy. The frontend is 100% HTML5 with CSS3 pre-processor and uses PHP 5.5x versions. Because of CSS3 pre-processor, developers have a wide range of options for creating attractive backgrounds, images, animations, themes etc and are highly compatible with most browsers. Your choice of eCommerce platform will greatly influence two important features – Performance and scalability. As speed has become an essential parameter to rank in Google, Magento 2.0 has proven to be 20% faster. It’s supported by Varnish and Redis for full page caching. This has considerably reduced server load and increased page speed by1-2 seconds. As indexing is more efficient, it’s now possible to handle 39% more orders per hour. With such enhanced and extensible functionalities and improved features, there’s no denying that Magento 2.0’s is ideal for larger stores. Testing forms are an integral part of quality. The Magento Testing Framework is completely revamped and automated. Because of this, integration and unit testing can be easily conducted. The tool, known as Functional Testing Framework, can run 170 automated functional tests. It increases productivity and reduces the necessity of regression testing. Also, authenticity of third party extensions will be thoroughly validated before they’re deployed. Magento 2.0 has a highly intuitive admin panel and is extremely user-friendly. Several significant features (Like drag and drop grid columns, content previews, custom views, easier navigation, keyword search and much more) make administrators and store owners work at ease. The concept of a split database makes it possible to have 3 databases (Main, Checkout and Orders). This creates less inter-dependency and guarantees increased performance. Another technology that makes Magento 2.0 admin panel awesome is RabbitMQ. It’s like a portable messaging system! It stores all your undelivered messages in a queue and connects with all your applications. Because of its transparent feature, site admins can easily find out what goes wrong in any department and immediately work to fix the issues. The Magento 2.0 front end is designed with mobile users in mind. With the rapid increase in mobility and demand for responsive designs, your favorite CMS has just got better with Magento 2.0. Not just for you, but also because responsive sites have become a key parameter to rank high in Google. By being mobile friendly, you have the benefit of having a wider target audience and influencing their buying decision. Magento 2.0 gives you the full potential of mCommerce by scaling up your business to sync with the present digital world. Back end user experience can affect the overall eCommerce process. Hence, it’s necessary to ensure a clean and organized backend user interface to increase productivity and avoid unwanted confusions. The menu system is completely reorganized (Marketing, Product, Content, Report) and are more function-centric. Because of this, backend UI user experience has greatly improved. Online stores can easily pave way for hackers if you don’t have a robust and secure system. This can also cause your customers to abandon your site and prefer your competitors. Magento 2.0 comes with major integrations like PayPal, Braintree and Cybersource to offer safe and secure payments. Because of their popularity among users, there’s no second thought about the reliability of the payment gateways. There’s an automatic update installer which ensures that the system is up to date. Hence, your eCommerce store is strongly protected from all kinds of vulnerabilities. Complex and long check out forms can irritate your customers and increase cart abandonment rates. Magento 2.0 has enabled guest checkout and further uses a two-step checkout process to quickly finish the entire transaction. Moreover, reducing checkout process by 40% greatly influences your conversion rates and boosts sales. Magento 2.0 is definitely a game changer in the eCommerce platform market. Its features are customizable and built for enterprises that want to deliver high performance and make the customer’s shopping experience a beautiful one. If you still want to know more and learn what upgrading to Magento 2.0 means to your business, we’re just a call away!